I am an obsessive list maker. I make full use of the ToDoist app, I always have sticky notes in my purse, Excel is one of my favourite pieces of software ever, and I constantly keep Notepad open on my computer with a running tally of what I want to accomplish that day. I also love a good notebook. Finding one with a funky design and good binding will get me every time. The problem is I always try to give my notebooks a dedicated purpose and my lists are spread out across every facet of my life. So when I first heard about bullet journaling, it seemed, on the surface, like the perfect way to combine my two obsessions. 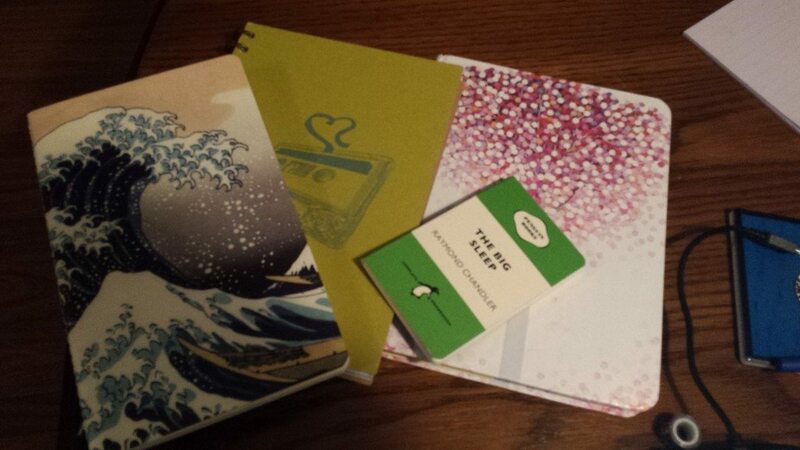 A few of the notebooks cluttering up my office. For those of you who may be unfamiliar with bullet journaling, the elevator pitch is that it’s a customizable, analog organizational system. It’s something that can function as your agenda, your to-do list, your journal, sketchbook, etc., all in one place. Originally developed by digital product developer, Ryder Carroll; you can find out more about inception and how to get started on their official website. I began to do a bit of research (research here being code for “browse Pinterest”), and I was initially a tad sceptical. If you want, your bullet journal can be made up of many unique parts (otherwise known as “layouts”). Anything and everything goes – daily gratitudes, a list of movies watched, exercise tracking, and so on. 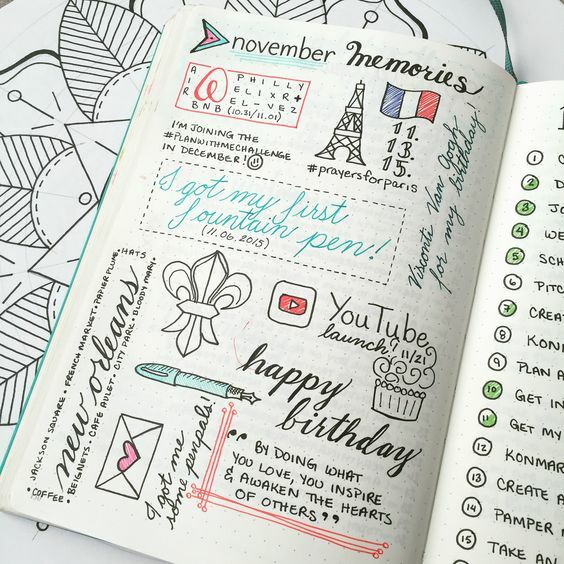 Some users spend a fair amount of time on the design/decoration of their journals. It felt overwhelming and way too time consuming since I was just looking for a place to keep track of all my scattered thoughts, notes, and ideas. But I have a good friend who swears by her own bullet journals, and she eventually convinced me to give it a shot. I decided I couldn’t be too precious about layouts or designs in the beginning. I would only start with the basics that made sense to me and then expand and adapt from there. Though the official bullet journal website has a handy “start here” section, I actually found the piece “WTF Is A Bullet Journal And Why Should You Start One? An Explainer” on Buzzfeed much easier to go off of. A 6-month future log – the future log is generally four pages with one section marked off for each month. But I started my journal in June so I only made one to cover July-December. A two page spread for June – which included a hand drawn calendar on one side and a single line for each day of the month on the other. The first of my daily logs – used for what bullet journal users call “rapid logging” a.k.a to jot down any tasks, events and notes on a daily basis. It kind of looks like a lot of set-up when I write it all out like that, but other than the calendar, all I really needed to do was number the pages, add a title, and copy information in from other sources (like ToDoist and Google Calendar). Once it was set up, I started using it right away and quickly added pages for things like meeting notes at work, rough drafts of book reviews, and grocery lists. Writing in it became a daily habit, and I constantly had the current “daily log” open on my desk at work so I could cross out tasks as I completed them (which is just the best feeling). I even bought my very first roll of washi tape to try and make my journal more Pinterest-y, but I never felt inspired to do any more decorating. The only use I found for it was to make a tab along the edge of the monthly log page to allow for easy flipping. By the time July rolled around, I decided I wanted to keep using the technique, but I made a couple of changes. The first was that I didn’t draw a calendar. I wanted to, but the June calendar had been so time consuming and didn’t turn out very well, and I hadn’t looked at it much until I added the tab. But not having that high level calendar view is something I really missed. I can keep track of my events/tasks better on a daily and even monthly basis but it’s not so great for planning or scheduling without the calendar view. If I set up August I’ll probably print out a blank one and tape it in. The other thing I decided to stop using was the daily logs. Since many of the items on my to-do list don’t have specific to-do dates I found I was constantly rewriting them (or “migrating” them in bullet journal speak) day after day. 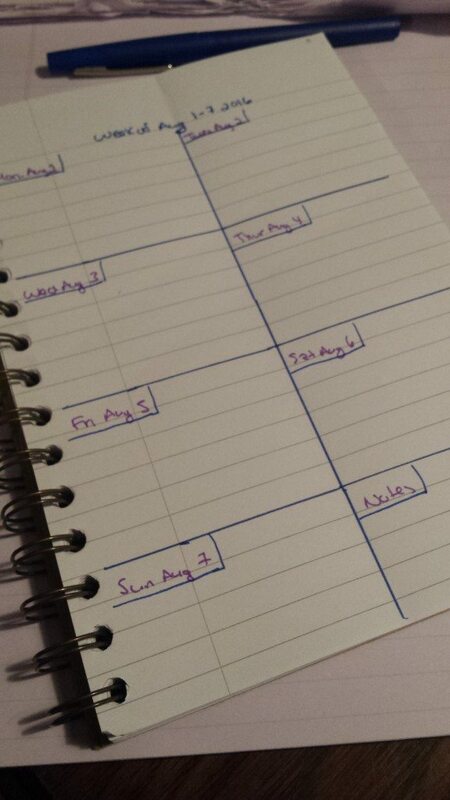 Instead I switched to a makeshift weekly log. Each day of the week had it’s own square – deadline and meetings could go on the appropriate day and more general tasks could be spread out across the week and marked completed when done. The added benefit being that I have a convenient weekly view that lets me see if I’ve overloaded myself or if I have room to squeeze something else in. Unfortunately, on a recent business trip to Nashville, I lost my first bullet journal, so as August approaches I have the opportunity to decide whether or not I want to keep using this system. There are certainly a number of benefits – for starters, it allowed me to compile all of my notes and ideas in one central location. And the layout is extremely flexible since I can decide what’s working for me and what’s not as I go along. The financial log, the WWAC pages, and my rough reviews were some of the most used sections. I found I was able to stay on top of things better and things were less likely to fall through the cracks. I still keep sticky notes in my purse and Notepad is still open on my computer, but I find myself turning to ToDoist and Excel less and less. Ultimately, I think the bullet journal system is worth trying. There’s a bit of a learning curve as you attempt to figure out what you need and how you need to access it. And some people may find that other methods – like agendas, apps, or Google Calendar – work better for them. For others, however, it could soon become exactly what they were looking for.